Hot weather and Summer vibes calls for endless grilling all season long. It’s time to take a quick break from the burgers and hot dogs and grab a bamboo stick instead! Who doesn’t love food on a stick? Fresh mango pairs extremely well with proteins like fish and poultry, allowing the sweet, sharp flavor of the fruit to give the protein an extra kick. This is a great way to get some of your fruit and vegetable servings in for the day. Grab a skewer and add it to your whole grain dish. Enjoy! In a large bowl, mix together chicken with olive oil, chili powder, adobo seasoning, brown sugar, lime juice and parsley. 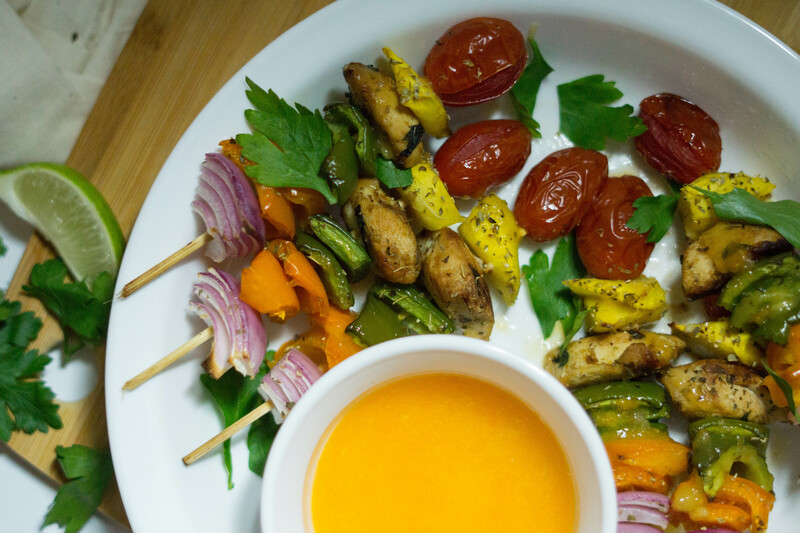 Using bamboo skewers, thread the chicken, alternating with mango, grape tomatoes, bell pepper, and onion slices. Grill the skewer for about 10-12 minutes turning every 2 minutes, until the chicken is cooked through. Take off the grill, garnish with parsley and serve!